1. Using a small spoon, scoop out the centre of the potatoes leaving a thin outer shell. 2. Heat a little oil in a pan. 3. Fry the shells and scooped out potatoes separately till crisp but not allowing them to change colour. 4. 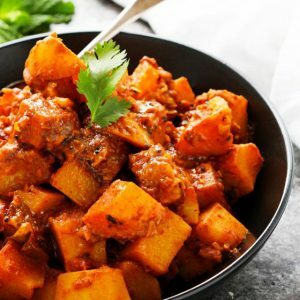 Keep the shells aside and mash the other potatoes with salt, red chilli powder, garam masala powder, lemon juice, cashews, raisins and ghee. 5. Stuff this into the shells. 6. Skewer the potatoes and sprinkle cheese on top. 7. Grill till golden brown. 8. Garnish with coriander leaves and chaat masala. 9. Serve hot, as a snack. 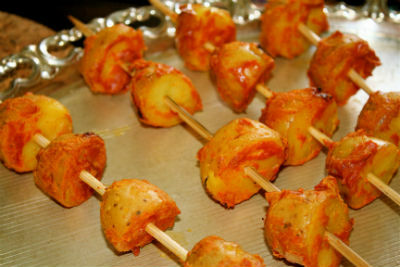 Feel free to comment or share your thoughts on this Tandoori Aloo Recipe from Awesome Cuisine.